FilterCopy, the flagship channel of Pocket Aces, releases a chuckelsome video ‘If parents behaved like us’ in association with Furlenco– India’s pioneering online furniture rental company. This sketch is the first release of the campaign in which the two young, fun and urban companies join hands to make very relatable content for the urban millennial around the theme “Live Life To The Fullest”. Acknowledging the merit of the fast growing digital entertainment industry, the video features popular film and theater actors Rajat Kapoor and Sheeba Chaddha playing the protagonists in this video. Rajat Kapoor was last spotted in the blockbuster movie‘Kapoor & Sons’ and Sheeba Chaddha made a cameo appearance in the 100 crore club movie ‘Raees’. The millennial psychology these days is to be socially present everywhere and at every given point of time. And the gamut of social media platforms has totally enbled the present day youth to do so. But what if our parents did the same? How would we react if our parents were posting snaps of almost everthing they did on Snapchat or Instagram, instead of paying attention to us? 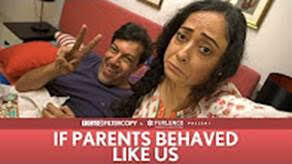 Get a sense of what would it be like If Parents Behaved Like Us through this hilarious video by FilterCopy. The video is a role reversal depicting the social media fad. Pocket Aces is one of the fastest growing digital entertainment companies in India today. The company conceptualizes, creates, and distributes engaging original content for millennial audiences through its channels Dice Media (sketches and web-series), FilterCopy (sharable and snackable short-form content), and Gobble (everything food). Pocket Aces has clocked over 120 million organic video views in the last 12 months, and is quickly becoming the digital company of choice for Indian advertisers. Pocket Aces uses data analytics extensively to create and analyze content, understand audiences, and optimize distribution and marketing spends. FilterCopy is Pocket Aces’ shareable content platform. It is one of the most popular digital brands in India today that offers snackable, mixed-media, millennial-focused, general interest content. The brand currently publishes 3-4 short videos/sketches and 60-80 articles every month. This is nice ,as we are all curious to know how it would be if our Parents behaved like us.